grass has many layers to get a fog receding effect. water is very calm, didnt want to make huge waves. the typography bit is the weirdest thing ive done cause theres no moon in the wall but theres a moon in the title lol. As always... Nice wallpaper... The sky is soo beutiful, damn I want to be good as you ^_^. anyway, your wall. its nice. very nice. the grass, good job indeed. not many ppl can use the grass brush that well. (they alwayz turn out weird). but you, you've done it quite nicely. Nice wallpaper. 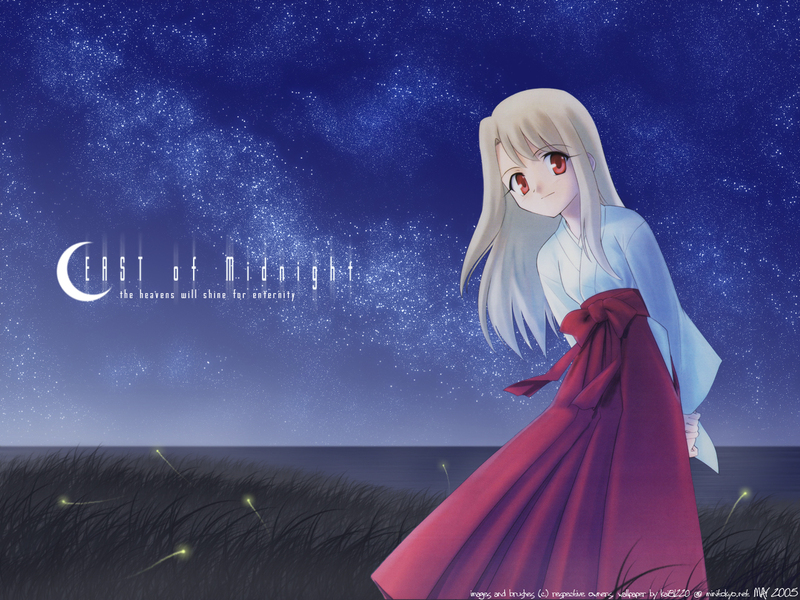 :D I like the background, soooo stary, and the character fits well with the starlit scene and fireflies. The absence of the moon is a nice change. It's an ok wallpaper and it is surely better than half of the stuff that is in the tops submissions right now. It is simple but at least it shows effort and it shows that you thought about a concept and developed it throughly. - The grass field is ok... somehow. I'd say that you could have used way more layers to give more depth, tricking with the fog over the grass is a good way to give depth but at the same time you appearently used not so many layers, so it's a bit weird. But it's still good. nice wallpaper. the girl is very pretty and the background looks great. but the grass there could look beter. Nice Wall, everything goes together very well. The grass is nice as ar the fireflies. The sky is pretty good, a little cluttered for my taste but it still looks nice. The scan is good and clear. (And Cute of course.) What I like in particular is the lighting. It makes the wall very .... peaceful I guess...Great job! The bg composition is good, everything matches well. Those layers of grass made the grass field look realistic, good work. That foggy effect and those fireflies enhances the midnight effect. And the captions, its cool how you implemented a moon in it. nice background composicion!! scan is good too!! humm... you should put more effects on background but it is ok! I like the bg, and the effects. The sky, wirh the stars is sooo beautiful!!!! And the little fireflys also!!!!!! Really nice wall! ^^ It's beautiful! I think the grass field is really well done, and the star field is lovely! ^^ Great job! keep it up! what are those flying yellow things?? are they suppose to be fireflys?